While similar in power to the 30-06, the .308 has become a very popular round for it’s edge in terms of accuracy. It’s an excellent round for hunting just about any large game on the North American continent. It’s also very reasonably priced compared to other similar rounds. Compared to the .30-06 Springfield, this load has slightly more drop at longer ranges due to its slightly lower muzzle velocity. But you’ll also get a longer barrel life with a .308 for exactly this reason. It’s one of our favorite deer hunting rifles for this exact reason. Here are some of our favorite .308 rounds. First things first, the Federal Fusion cartridge is rather renowned for deer hunting purposes. In fact, it is designed specifically for whitetail deer hunters. So, what makes it popular? To answer your query, its new bullet technology promises excellent terminal performance hence allowing you to make quick and clean one-shot kills, for a better shooting performance. Moreover, it comes with a total of 20 rounds altogether. These rounds are arranged and organized in a neat manner in the box for easy handling and simple portability, for added convenience. However, you can get yourself a reload pouch or strip (under shooting accessories) so you get to strap them to the sides of your gun to provide easier access to the rounds. The ammo on the other hand is brass-cased and boxer-primed. The plus point of this type of casing is that it provides you with the reloadable and non-corrosive characteristics. By reloadable, I mean that when you have used up the old primer, you can conveniently remove and replace them with new ones. Moving on to the bullet performance, it has a muzzle energy measuring 2671 foot pounds (ft lbs) and muzzle velocity measuring 2700 feet per second (fps) altogether. The bullet weighs 165 grains (good enough for bigger games) in total. Just so you know, it is important to have sufficient weight (over 100 grains) when dealing with larger animals because it needs to reach the vital organs for a quick and humane kill. Fusion loads are developed using an electro-chemical process which functions to join the lead core to the copper jacket, thereby preventing core-jacket separation upon impact. As a result of that, it is has enhanced weight retention which ensures the bullet deliver a high impact lethal shock as it expands, when in contact with the target. Here is a brief process of how the Fusion bullets are made. Firstly, the lead core is formed under high pressure for good strength and expansion followed by the copper jacket being deposited on the core at the rate of one molecule at a time, for total integrity. The top and the base are then pressure-formed based on specifications to optimize its terminal performance. Finally, the tip is skived to provide unmatched long range expansion potential. Weighing 168 grains altogether, the weight is good enough if you plan on targeting medium sized to large games. For your information, the bullet weight should be sufficient enough especially to penetrate through the thick hide and skin of the game, to make way to its vital organs for a quick blow. The quick blow is important for a humane kill, so the animal wouldn’t have suffered. In addition to that, it is of the Barnes Tipped Triple-Shock X type. The good thing about these rounds are that they are lead-free, hence you can use it anywhere, especially in lead-prohibited areas. The TTSX cartridges feature the Spitzer boat tail design. That being said, this solid copper projectile contains zero lead (as mentioned above) as well as is polymer tipped to provide you with an excellent ballistic coefficient measuring 0.47. If you’re wondering, the ballistic coefficient refers to measure of the air drag which basically is how well the bullet cuts through the air when the rifle is fired. They also come with excellent long-range ballistics and rapid expansion when in contact with the target. Rapid expansion is essential to prevent over-penetration. For your information, over-penetration is dangerous as it may cause collateral damage. 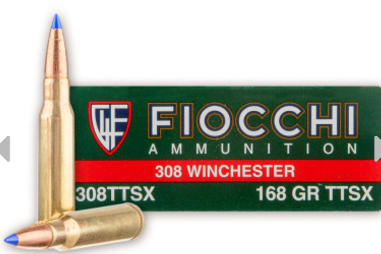 Back to its history, the Fiocchi ammunition is designed by Giulio Fiocchi that suits the needs of hunting enthusiasts, armed forces as well as target shooters. However, it is mainly use for deer and elk hunting purposes. There are a total of 20 rounds in the box where they are packaged in an organized manner for easy removal and access. In terms of performance, once leaving the muzzle, the projectile travels at a velocity of 2670 fps, paired with muzzle energy measuring 2659 ft lbs. If you’re wondering, the theory is rather straightforward where the heavier the bullet, the higher the energy and velocity hence resulting in a more devastating result. For the casing, it is made from brass hence ensuring that it is corrosion-free at all times, especially when in contact with rain or moisture in the midst of hunting. It is boxer primed hence you are able to reload the old primer with the new ones, with just a simple pin punch. Manufactured by Federal brand, the premium Vital-Shok ammunition line is one of the best round you should have with you when in the field, to provide you with maximum reliability and accuracy, in the midst of hunting. In fact, it is designed specifically for deer and wild boar hunting (medium and large-sized games) purposes. Equipped with 20 rounds altogether, they are packaged in an orderly manner, in boxes to ensure simple access as well as convenient portability. If you’re an avid hunter/shooter, then you should go for the ammunition available in bulks because they can last you a longer time, not to mention, it is way cheaper in terms of price per round. Furthermore, this deer hunting ammo features the top-of-the-line Trophy Bonded Tip that comes with a lead core which is plated in nickel and copper to provide you with great corrosion resistance as well as weight retention. For your information, bonded cartridges comes in handy as it eliminates the jacket and core separation upon impact. In other words, they hold together to retain weight better hence contributing to deeper penetration and wound channels. The bullet then is topped with an aerodynamic polymer tip so it can travel faster with a lower trajectory, hence increasing the penetration which comes in handy when dealing with larger games. In terms of performance, the projectile exits the muzzle and flies at 2700 fps velocity with 2671 ft lbs worth of muzzle energy. If you’re wondering, polymer tipped bullets comes with a plastic tip that provides you with the added advantage of fragmenting and expanding hollow point cartridges. Therefore, they drive into the hollow point then splits into pieces, resulting in multiple wound tracks in the target. Moving on to the casing, they are boxer primed and made from brass construction, thereby contributing to its non-corrosive and reloadable characteristics, in the long run. To be honest, this cartridge is my personal favourite deer hunting ammunition. This is solely due to the accurate and deadly knockdown power of this Hornady’s round nose bullet, with its success proven over millions of hunts. That being said, these American Whitetail cartridges are equipped with optimized loads tailored specially for whitetail deer hunting. Weighing 150 grain, this product comes with Hornady’s legendary Interlock Soft Point cartridges which is all in all, a great combination of ballistics, modern components and not forgetting, an affordable price. That being said, the Interlock bullets are designed to eliminate jacket and core separation upon impact, therefore resulting in improved weight retention as well as reliable terminal ballistic performance. In addition to that, they are equipped with a raised ring inside the jacket. This ring is embedded in the core of the bullet thereby keeping it locked together during expansion in order to retain the mass and energy. The retained mass and energy will then contribute to deep penetration as well as large and consistent wound channels which comes in handy to ensure quick and clean kills. The casing on the other hand is made of brass and is boxer-primed. The brass constructions ensures that it is non-corrosive meanwhile the boxer-primed method allows for the old primer to be removed and replaced with the new ones, hence it is conveniently reloadable for your added convenience. If you’re wondering, the boxer-style primers are famous in the United States. The rated muzzle velocity (velocity once bullet leaves the muzzle) measures 2820 fps whereas its muzzle energy measures 2649 ft lbs. High muzzle velocity and energy comes in handy for deeper penetration which is important if you’re target is a large or medium sized game. Apart from that, it has 20 rounds per box altogether where these 20 rounds are arranged well for easy access and convenient handling, in the midst of hunting. 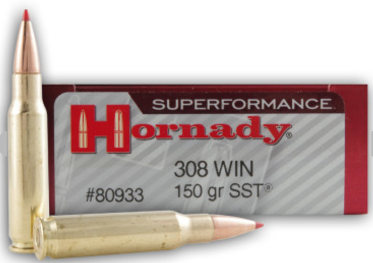 First and foremost, the Hornady Superperformance load comes with a total of 20 rounds per box altogether. They are arranged and packaged properly in such a way to ensure easy access and removal for the hunter/shooter. However, if you’re a frequent hunter, you should totally get ammunition in bulk because it will last you a long time and is way cheaper in terms of price per round, compared to buying multiple boxes each time they are used up. All in all, they prove to be an ideal hunting round. The ammo on the other hand is brass cased and boxer-primed. Having the brass case comes in handy to ensure that it is rust-resistant at all times, especially when in contact with rain or moisture (because you’ll obviously be hunting deer in the wilderness!). The boxer-primed style is a popular primer method in the US, in which its added benefit includes that it is reloadable when the old primers are used up. Mainly used for deer hunting, this product weighs 150 grain altogether. For your information, heavy bullet weights comes in handy to provide deep penetration, especially if you’re targeting larger games because it needs enough power to penetrate through the thick hide and skin, in order to reach the vital organs, for a quick and humane kill. Hence, the heavier the weight, the higher the muzzle velocity and energy therefore producing a more devastating result. That being said, the muzzle velocity measures 3000 fps meanwhile the muzzle energy is 2997 ft lbs altogether. Not only that, this .308 Winchester ammo features the proven polymer tip design which contributes to flatter and straighter trajectories with a great knockdown power. Apart from that, the sharp point of this SST round increases the ballistic coefficient, therefore providing more energy upon impact. Once in contact with the target, the polymer tip allows controlled expansion for all speeds. In addition to that, the SST technology features Hornady’s Interlock ring which functions to prevent the core and jacket from separating, hence maintaining their mass and energy. The Norma Tac ammunition is specifically designed for deer hunting. Weighing 150 grains, its weight is sufficient enough for medium or large sized games. If you’re wondering why, it is solely because heavier bullets will have enough power to penetrate through the thick hide and skin of the large game, to reach its essential organs for a quick and devastating blow. Moreover, there are 20 rounds altogether included upon the purchase of this product. These 20 rounds are packed neatly in a box, for easy handling and simple portability. However, for better access, I suggest that you purchase a reload strip or pouch in which you can store your bullets securely for game hunting. In terms of performance, the projectile exits the muzzle and flies at 2660 (muzzle velocity) feet per second meanwhile the rated muzzle energy measures 2357 foot pounds. The theory is rather straightforward where the heavier round will lead to a high muzzle energy and velocity, thereby resulting in a more devastating result. Moving on to the casing, it is boxer-primed, similar to most of the top rated .308 Winchester ammunition. For your information, the boxer-primed method is mostly used in the United States (berdan-primed method used at the outside of the US). The plus point of this primer style is that it is reloadable. In other words, you can conveniently take out and reload the old primers with the new ones, with a simple pin punch. Apart from that, it is loaded with the FMJ boat tail cartridge, which provides and guarantees an accurate as well as flat shooting trajectory for the best shooting experience. The boat tail round is easy to identify as it has a shape that is similar to the design of the stern of the sailboat which contributes to its higher ballistic coefficient and retained energy. Meanwhile, the full metal jacket type is well known for its deep penetration due to its heavy jacket. Also, they have excellent feeding system which comes in handy to provide a smooth shooting operation. For over more than 6 decades, the Remington Core-Lokt rounds have remained as one of the top ammunition in the centerfire hunting round for deer hunting purposes. Believe me, you won’t regret it due to its excellent performance. Why is that so? It is mainly because it features the unique pointed soft point core-lokt design. With this design, it is equipped with a Spitzer-shaped profile to contribute to flat trajectory and improved velocity. The term Spitzer is taken from a German word which refers to sharp pointed. In other words, it can be easily identified by its long ogive point shape closing that comes with a small diameter exposed lead tip. The advantages of having the Spitzer design is that, it provides much higher ballistic coefficients and has controlled expansion compared to the traditional flat or round nose cartridges. In addition to that, it includes the tapered copper jacket that is locked to a solid lead core thereby leading to a perfect combination of high weight retention and controlled expansion. Speaking about the ballistic coefficient, this product cuts through the air towards the target at coefficient 0.314 with a muzzle energy measuring 1964 ft lbs and muzzle velocity measuring 2390 fps. It is of lead composition so it’s important that you know the rules and regulations at the area you plan on hunting, so you don’t unknowingly stumble upon lead-prohibited areas. This projectile is of the pointed soft point (PSP) style in which it comes with a pointed tip that promises flat trajectories at longer ranges. The ammo on the other hand is boxer primed hence, it can be conveniently reloaded, according to your preference. In other words, once the old primer is used up, you can remove and replace them yourself, with a simple pin punch. Apart from that, it includes 20 rounds altogether, per box. They are arranged in an orderly manner in the box which is rather important to ensure easy portability and convenient handling in the midst of hunting. The bullet weight is measured in unit grains. First things first, the weight should be approximately above 100 grains so that it provides enough knockdown power upon impact. This comes in handy especially if you’re targeting larger games because the load needs to penetrate through the skin and hide, before reaching its essential organs therefore providing a quick and humane kill. There are multiple bullet types out there (check out the guide here), which basically depends on your personal preference. For deer hunting, it should have rapid expansion and deep penetration for the best shooting performance. It is important also that the core and jacket doesn’t separate upon impact as well as it shoots with flatter trajectories for an accurate and reliable shot. The most popular primer style among this top 7 products, and in the United States is the boxer-style primers. For your information, a primer functions to ignite the powder charge before your shot is fired. So, what makes the boxer-primed style famous? It is solely because it is reloadable. By reloadable, I mean that the old primers that are used up, can be removed and replaced with a brand new one with just a simple pin punch.